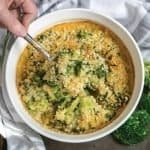 This Skinny Broccoli Cheese Casserole is a great healthy recipe for when you are craving comfort food! Pour 1/4 cup of olive oil in a large skillet over medium high heat. Add the frozen cauliflower rice to the skillet and saute until thawed (about 5-7 minutes). Once the cauliflower rice has thawed, sprinkle 1/4 cup of flour, 1/4 teaspoon garlic salt, 3/4 teaspoon salt, and 1/2 teaspoon pepper into the skillet and stir until the flour has absorbed all of the oil (it should look lumpy). Stirring continuously, pour in the 2 cups of broth and 1/4 cup of milk. Keep stirring until the mixture reach a simmer and thickens to resemble a gravy (7-8 minutes). Turn the heat off, and add 2 cups of cheddar cheese and 1 cup of Parmesan. Stir until the cheese has melted, then add the steamed broccoli florets. Mix everything together and pour into an oven safe casserole dish. Optional: Mix together 1 teaspoon olive oil, 1/2 cup Panko bread crumbs, and 1 Tablespoon Parsley. Sprinkle on top of the cheesy broccoli mixture. Bake for 25-30 minutes and enjoy! Creative Additions: Feel free to add shredded chicken to make for the meat eaters in your life! Another idea is to play around with the types of cheese you use. I think Swiss cheese would be delicious! Also, don’t be afraid to add more vegetables! Zucchini and squash would be amazing in this recipe. Or add some cooked diced or shredded potatoes! Yum! GET UPDATES + COOKING TIPS + TRICKS!